One of our favourite things about any fashion week in India is that it’s never complete without the presence of celebrities, both on and off the runway. Bollywood divas aren’t uncommon as showstoppers and they definitely garner a whole lot of attention for the designer. Much to our delight, Wills Lifestyle India Fashion Week Autumn/Winter 2013 saw a bevy of Bollywood stars making appearances both on and off the runway. Surily Goel, Joy Mitra, Paras & Shalini, Urvashi Kaur and Manish Malhotra were the designers to give us our much-needed dose of Bollywood on the runway. While it’s unconditional to have stars from the film fraternity take part in fashion weeks, Indian designers make an exception and we’re not really complaining, are we? Preity Zinta was the showstopper for Surily Goel, looking radiant in a one-shouldered black gown. Her hair was styled into an updo, red carpet style and we have to say she looked every bit the delightful Bollywood diva. Paras & Shalini brought out the captivating Shahzaan Padamsee, also in a black dress, albeit a slightly unconventional one with fringe detailing. Her hair was twisted into an updo, with intricate braids and twists woven together with embellishments and tassels. Designer Joy Mitra, gave Gauhar Khan the traditional Indian ensemble that was topped off with her hair curled tightly and pulled over one shoulder. A look you can try at home, especially if you have jewellery and detailing to draw attention to. Gul Panag also made an appearance on the runway, in a dress designed by Uravshi Kaur and complemented with a high tight updo. Gauhar Khan’s and Gul Panag’s hairstyles showed off their creation’s detailing, so we can definitely take something away from the styling – go for a hairstyle that will best complement your outfit. 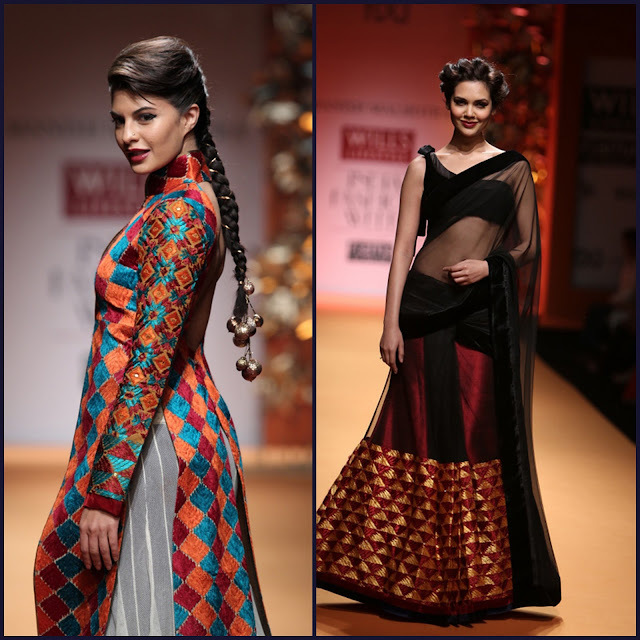 his designs on Bollywood stars Esha Gupta and Jacqueline Fernandes. Long braids interwoven with gold ornamentations added the final touches to the designer’s creations. While WIFW might be over, we now have Lakme Fashion Week and a whole new host of Bollywood actresses taking to the runway. Kareena Kapoor is already the showstopper everyone’s talking about. Check back here for updates on Lakme Fashion Week Summer/Resort 2013! 4 Super Pretty Hairstyles of Janhavi Kapoor!